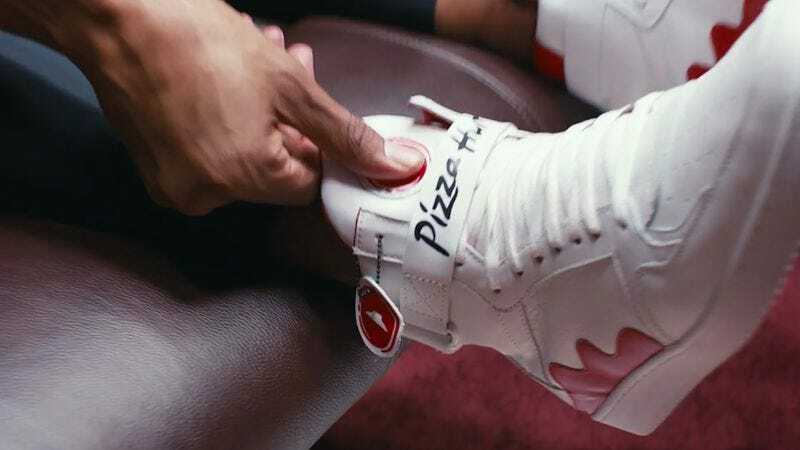 Refusing to be beaten in the fierce, competitive world of lazy food procurement by a delivery neophyte like McDonald’s, Pizza Hut has announced that a handful of lucky customers can now literally strap a “bring me pizza” button to their bodies in the form of pizza-ordering shoes. Per Advertising Age, the company has just debuted a new marketing campaign centered on the “Pie Tops,” a custom-designed pair of sneakers that include a button that alerts your local restaurant to a pizza-based emergency. Sadly (or fortuitously, depending on your personal eating habits), only 64 pairs of the shoes are being made, and most of them are being given to ”media and influencers.” (The company wants to reinforce its connections to March Madness, while also presumably putting their new toys in the hands and feet of those least likely to suffer a heart explosion while leaning over to order their sixth pepperoni and extra cheese of the day.) A few lucky superfans will get their own pairs, though, making them the envy of grease-stained early adopters everywhere.